Any product that needs to be heavily subsidised to facilitate mass market entry is always going to struggle in the short-term. 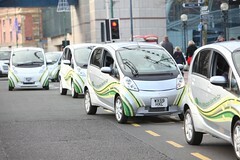 The recent car scrappage scheme has done electric car manufacturers no favours. In the current economic climate their is simply not the demand for a product which commands such a high price. The relative success that Toyota experienced with the Prius was more due to the company’s then impressive reputation coupled with celebrity endorsements and snob appeal rather than any demand for the actual product. As long as consumers continue to suffer information failure on this sort of product it will not be a viable venture.